The scene that prompted this post: two of the birds had died, and we see Joe digging their graves. Burying a turkey? We ask ourselves, especially at Thanksgiving, why we would collectively bury one animal yet would eat another. In this case, it isn’t regarding different species (e.g., dog vs. pig), but a comparison of turkey with turkey. How can a distinction be conceived? It has less to do with the species of animal, and more to do with our perception and relationship with them: if they are conceived as part of a group or as individuals, as a resource or a person(ality). For Joe it is simple: they were family. Today I lost two birds to some unknown illness, and I feel heartbroken. There’s no question about my connection to this family. There’s no question that we all feel some deep sadness. The effect on this group is palpable. Emotions are certainly not peculiar to the human experience. In their observation of death, the death of another turkey that is a member of their group, it’s a very conscious behavior, as if they’re trying to understand what the meaning of this is. Later, we observe a particularly strong relationship maturing with one turkey whom Joe names Turkey Boy: we see it shift from parent-child to brother-friend, to an all out sibling attack. Such a turn has bearing on the work of Family Spirals™ (the organization which hosts our Green Pet-Burial Society). 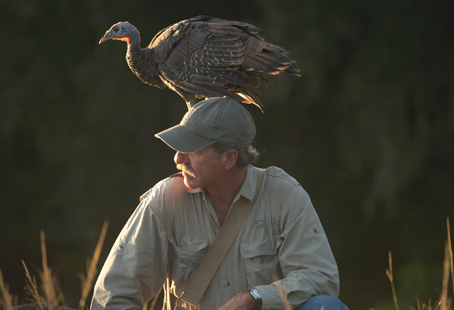 the State of Florida trapped wild turkey hens, installed radio collars in Spring, robbed nests when they started laying, and the backwoods savvy actor, Jeff Palmer incubated and began “imprinting” the eggs. (Hens, by the way, will nest a second time or even a third if they are unsuccessful on the first try.) … The guy you see with the birds is always Jeff. They did in fact film for over a year in order to record all the development and life cycle. This entry was posted in animal, burial, companion animal, green burial, Joe Hotto, Thanksgiving, Turkey and tagged Animals, burial, Family, grave, Images, Inspiration, Joe Hotto, nature, Parenting, Thanksgiving by Eric Greene. Bookmark the permalink. I had the privilege of having a beautiful turkey in my life. A friend found her wondering the streets as a chick. I took her in to live with my chickens. She was the most stunning in appearance and very smart and even sneaky! I loved her so very much! She didn’t get along that well with my chickens because they feared her. She tired desperately to fit in, but it didn’t work. So for many months I just enjoyed her inside where she seemed content, but I knew she was lonely. Through extensive looking and talking to people I found her the perfect home. A lovely 10 acre Vegan ranch that had 4 other turkeys and dozens of chickens who were used to turkeys. I went back to visit her and there she was dust bathing with a large group of chickens around a tree. She seemed truly in her element. I will miss Camille forever. But I know I did the right thing for her. What a beautiful and unselfish story, Mary. Thank you for sharing. People often take for granted that other animals have unique personalities, interests and desires, and can experience a sense of contentment. A very good documentary indeed!